From working in finance and management for one of the largest gas and electricity utility companies in Europe, to now specialising in humanitarian aid and capacity building in Syria: We spoke to Fadi Al Dairi, co-founder of “Hand in Hand for Syria” about the challenges the Syrian diaspora faces in its war-torn country of origin. What is Hand in Hand for Syria and what work does it do? Hand in Hand for Syria is a humanitarian organisation that we started in May 2011 to support the humanitarian response inside Syria when the war started. Summarised, it’s a Syrian diaspora working on the Syrian humanitarian response. We have offices inside Syria and coordinate locally through them, supported by our offices in the UK and Turkey. Can you tell us more about the organisation’s early days? I felt the strong need to help when I was confronted with the human suffering in Syria via the media. It all started fairly small when my chairman and I began collecting funds in the UK to send much needed aid to Syria. The challenge was to do so covertly since our helpers involved in Syria faced the threat of imprisonment, torture and perhaps death. Our work involved a lot of travelling between the UK and Lebanon to buy medical equipment, which we transported in suitcases. We would also relocate injured people from Syria into Lebanon to the Lebanese Red Cross to ensure adequate medical care. Those activities got us expelled from Lebanon at some point, which led us to shift our support to hospitals in Syria again. Is there a particular success story from your work you’d like to share? The entire project is a success story. We started from zero and turned this organisation into a multi-million dollars enterprise with almost 560 employees. Hand in Hand has faced many challenges when linking the diaspora’s efforts to the efforts of people on the ground. All this in addition to fighting for media attention. We have also faced security challenges in the field, however, we have persevered to serve our beneficiaries. 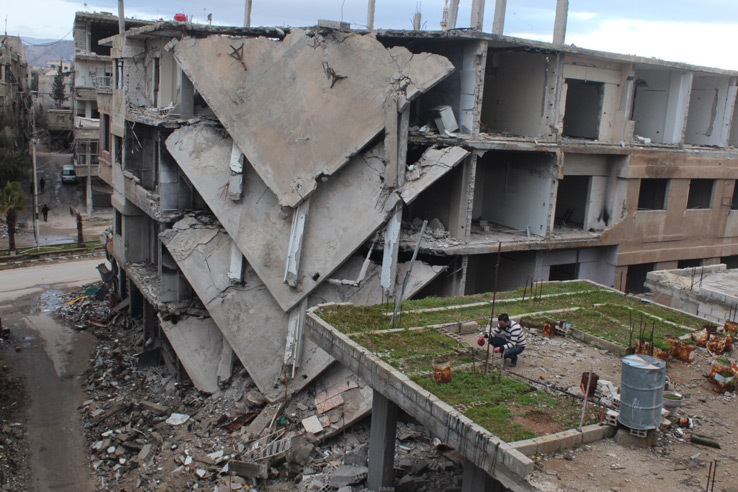 Could you tell us more about locally driven community development projects across Syria? What challenges do they face? On the humanitarian side, it’s amazing how much work Syrians have done over the past 6-7 years. NGOs in Syria are facing challenges in terms of getting funds, being able to respond efficiently to humanitarian needs and raise awareness about their situation. The coordination and prioritisation of aid is crucial. Hand in Hand, for example, works in sectors like health, nutrition, WASH, and food security and protection. Other areas like education have never been our expertise, however, there are other NGOs in Syria covering this sector. Coordination between NGOs and the Syrian diaspora is essential. Also, delivering humanitarian response today is complex and difficult since it has become very politicised. For example, we are unable to provide aid in government-controlled areas. What do you imagine the Syrian diaspora’s role will be in Syria when the war ends? We don’t expect the diaspora to lose any regional importance. When the war ends, we must start focusing on the development of Syria in areas that are out of government scope. There will be people with permanent injuries who need care. We will have to rebuild communities that have been damaged by the war. Healthcare and education, on the other hand, are within the responsibility of the government. But even in terms of our children, think about how much education the current generation have missed out on due to the war. A large part of the population is illiterate. On top of that, there are so many widows and orphans who need support. What other advocacy does Hand in Hand take part in? Hand in Hand is a founding member of Syrian NGO Alliance (SNA). This is an advocacy platform hosting most of the biggest Syrian NGOs and is an umbrella for diaspora and local NGOs who deliver about 70% of aid in Syria. We develop and coordinate messages to share with the broader community which highlight our common concerns. I will be presenting a photo exhibition at the DIA conference on behalf of SNA, sharing the everyday lives of the people in Syria. Hand in Hand is also a member of the NGO Forum, another advocacy channel. I’m in the steering committee. Furthermore, we are the hosting agency and cluster co-lead for the WASH Cluster, which is led by UNICEF. Mohammad and his family live in their destroyed home in Arbin. He plants vegetables on the roof to secure some food. Arbin, Eastern Ghouta, 07/03/2017. Photo credit: Syrian American Medical Society. 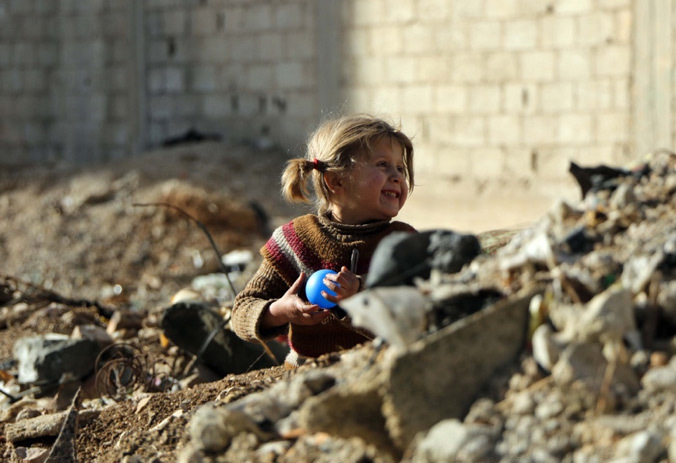 How does Hand in Hand for Syria monitor its work to ensure a legitimate distribution of aid? Monitoring is based on the MEAL-concept: Monitoring, Evaluation, Accountability and Learning. This includes a monitoring team, feedback mechanisms as well as constant direct contact with beneficiaries to verify deliveries. The MEAL team is involved in all our project designs and have to approve all components of a project. A central question I get asked a lot is how we ensure that we stay free from the influence of armed groups and the resulting diversion of funds. The answer is that Hand in Hand does not negotiate with armed groups and we would gladly stop an entire negotiation before giving in. For example, we cater to several hospitals in the region. Imagine the public outrage and pressure on the terrorists, should we stop any distribution of food and supplies as well as stop medical support. Also, we are working in solidarity with other large Syrian NGOs. If one of us were to be subjected to a violent group, we would all seize to operate in that area immediately. 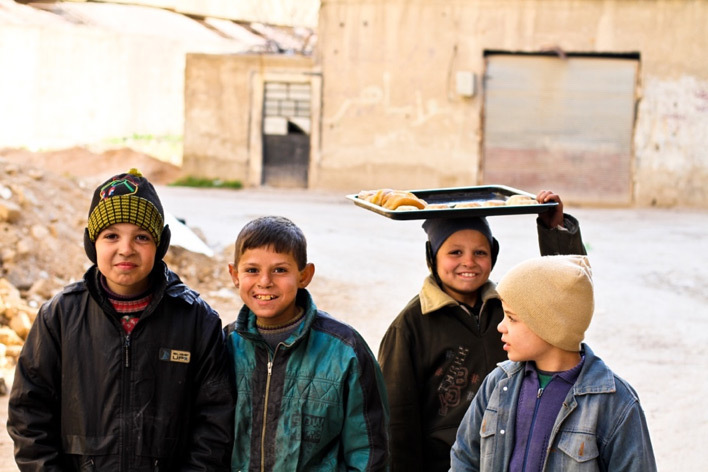 Children selling sweet pastries in the streets of Douma. 26/01/2016. 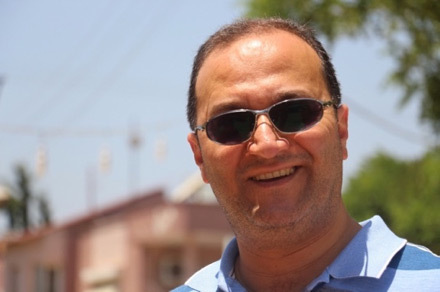 Fadi Al Dairi will be a keynote speaker at the Diasporas in Action conference in September. Diasporas In Action: Working Together for Peace, Development and Humanitarian Response, will be held at the University of Melbourne on the 26th-27th September, 2018. This new, exciting symposium will bring together NGOs, academics, diaspora and government representatives, donors and others, to explore how diasporas contribute to peace, reconciliation, development and humanitarian efforts in multiple contexts, such as their countries of origin, sites of displacement and third countries. Fadi Al Dairi will also present a photo exhibition on behalf of Syrian NGO Alliance. The images included in this article are part of the exhibition.